“Germanwings 9525, Malaysia MH370, Unmanned Aerial Vehicle policies and the problems they present – these are all issues that have captured our collective attention of late – and for good reason, too,” says Carbone, who carries an extensive background in the commercial aviation industry, with more than three decades of experience. In the novel, a wide-body jet is nearly lost in the Pacific Ocean; the cause: unknown. Despite the seriousness of the incident, the National Transportation Safety Board (NTSB) management decides against an investigation. Daniel Tenace, a dedicated NTSB accident investigator, has seen a similar malfunction before. Acting on his own, he investigates the unusual occurrence against mounting pressures from his superiors. But just as Dan starts piecing it together, a routine passenger flight ends in tragedy on a runway in Memphis; the events leading up to this crash are identical to the near-disaster over the Pacific. Dan leads the accident probe; relying on years of experience, he must determine if the accident was caused by the aircraft, the pilot, or new air traffic technologies that were installed. If he fails, the lives of many and the future of modern aviation could well hang in the balance. Stephen Carbone is an FAA-certificated aircraft technician and has been active in the commercial aviation industry for over 30 years. He was an aircraft mechanic for a major airline, repairing state-of-the-art airliners and managing maintenance work crews with a front row seat into both sides of a successful airline. After acquiring his Masters degree in Aviation Safety Systems, Carbone was hired by the NTSB to investigate major aircraft accidents both domestic and international. While at the NTSB he streamlined how they investigate aircraft maintenance and engineering issues. He trained future investigators at the NTSB Academy and taught aeronautical students at a nationally recognized aeronautical university, instructing by use of his experiences. He later worked at the FAA for over a decade as a technical specialist and air cargo point of contact, supporting FAA inspectors to the airlines. He wrote articles for aviation trade magazines that were read by thousands of aircraft technicians, pilots, and engineers. 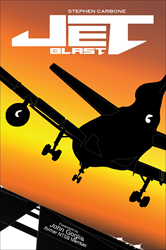 “Jet Blast” is the aviation author’s first in a series of stories that give the reader a first hand look into how accident investigations are really conducted, from a FAA-certificated technician’s point of view.